The column was discovered in 1763, during the excavations for the reconstruction of the bell and clock tower of the old Town Hall. Carved in greek marble, it holds a Byantine capital of the 12th century, with a lion of St. Marc on the top, which is popularly called "the cat". The mayor G. Mussato hade placed it in its present site in 1786. The balcony of the city and the most artistic of the nine bridges crossing Vena canal, it represents what for Venice is Rialto Bridge. 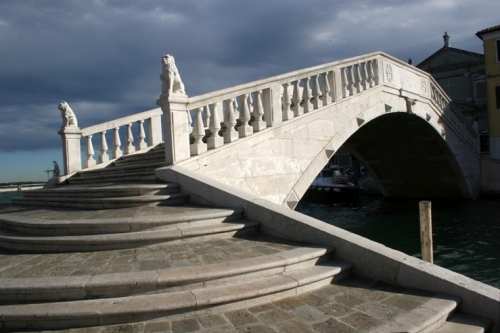 It was built in 1685 to replace a bridge of wood on which harsh fights occurred during the war of Chioggia (1379-80). Originally a masonry bridge, it was adorned with marble from Istria in 1762. In the past, a light used to be placed on it as an orientation signal for the mariners.